Lydia Dacorte of Wheaton College poses with her trophy after posting a fourth-place finish in the 500-yard freestyle on March 20 at the NCAA Division III championships in Greensboro, North Carolina. The former Mount Desert Island added an eighth-place effort in the 1,650 free to claim a second All-America award. Lydia DaCorte earned her second All-America honor on Saturday at the NCAA Division lll Swimming and Diving Championship. 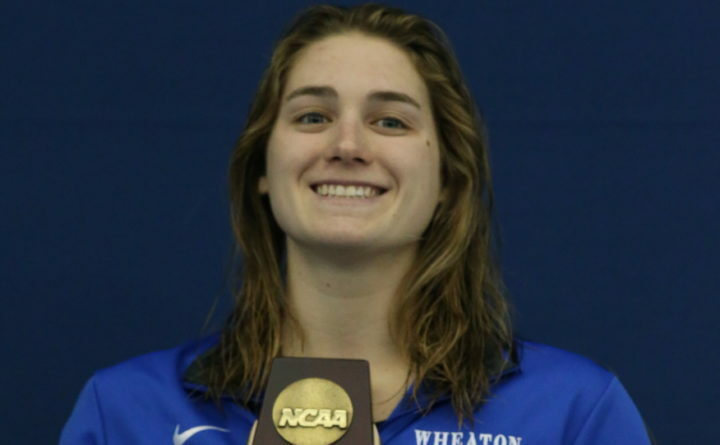 The Wheaton College sophomore posted a time of 17 minutes, 0.6 seconds, to finish eighth in the 1,650-yard freestyle. DaCorte, who swam at Mount Desert Island High School in Bar Harbor, received her first All-America recognition earlier in the meet with a fourth-place finish in the 500 freestyle. She also scored in the consolations of the 400 individual medley at 4:28. Also at the Division III meet, Sterling Dixon of Bowdoin College in Brunswick touched second in the women’s 200 butterfly (2:01.2). Julian Abaldo of Camden recorded a 45.5 on the Polar Bear’s 13th-place 400 free relay (3:02.3) and swam a 1:43 on Bowdoin’s 14th-place 800 free relay squad (6:47.9). Emory University won the women’s team title, while Denison University claimed the men’s championship. At the Division l Championship, Florida State senior Leila Johnston, an MDI graduate, split 23.9 on the butterfly leg of the Seminoles 1:37.2 medley relay that finished 17th. Caitlin Tycz of Brunswick, swimming for the University of Southern California, finished at 52.6 in the 100 butterfly and 1:56.7 in the 200 fly. Stanford won the championship, and the Trojans placed 10th. The University of Texas will host the men’s NCAA Division l meet Wednesday through Saturday.